These pics show the difference in the patterning between a sharp snow and a sharp snowglow with the snowglow having the tell tale bowtie patterning which lets you know that the orange tail gene is there, making it a triple visual designer mutation. 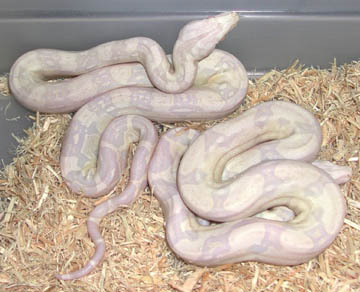 Besides the difference in the patterning, there is not a whole lot of difference in the coloration of these two designer morphs. will any more difference come as they mature? Only time will tell. These are brothers that came from an orange tail double het for sharp snow (A.K.A. 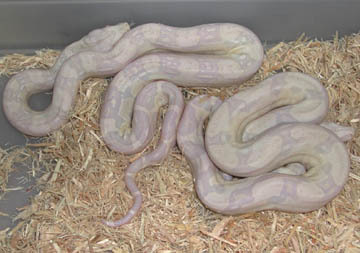 triple het for Sharp Snow Glow) x female double het for sharp snow breeding. CB 6-19-08.